Our mission is to mobilize local churches to transform lives and communities In the Name of Christ. ​"For you know that God paid a ransom to save you from the empty life you inherited from your ancestors. And it was not paid with mere gold or silver, which lose their value. It was the precious blood of Christ, the sinless spotless Lamb of God." ​Everything we think, say, and do is In the Name of Christ. 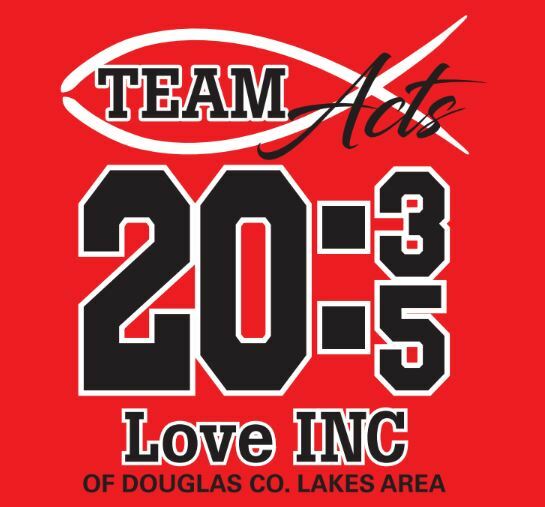 Join Team ACTS 20:35 Today! any and all donations are deeply appreciated Here's a Chance to act now! Jesus shares,"It is better to give than to receive." We are looking for 100 NEW donors to help support our growing ministry. Join Team Acts 20:35 today! to support Love INC and help neighbors in need. For less than 68 cents a day you can help change someone's life, right here in Douglas County! happy 10th birthday love inc of douglas county! Ten years ago, the Unity Foundation hosted a guest from Love INC National. His words inspired Douglas County to start an affiliate here. The mission he spoke of lit a fire... a Christian, volunteer based non-profit organization. Love INC is a strategy to help local Christian churches help our neighbors in need. Alexandria was dubbed a "city on the hill, fertile ground for such a powerful ministry, uniting the body of Christ." Visit our website to watch a slideshow of the history of our affiliate. Our churches here in Douglas County are phenomenal and accomplish even more kingdom work together. This expands into our community, restoring relationships back to each other and the Lord. Thank you to all of our partners: churches, businesses, agencies, other non profits and of course, our volunteers for being the heartbeat of this ministry. We are humbled and love serving you! Thank you for your support. Mobilizing local churches to transform lives and communities In the Name of Christ.